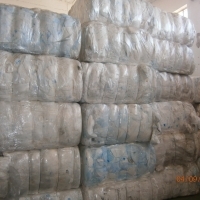 We can supply large quantities of Adult diapers + pads whole, production rejects (Include cotton, cellulose, tapes etc.) on an ongoing basis. You can contact us directly for price offer and additional information. Evaporative cooling pad Our evaporative cooling pad have the advantage : 1.Adopting Europe imported fiber paper ,high absorbability, high water resistance 2.Using anti-mildew and moth-preventive material with long life service 3.Using spatial crossing linking technology, Large evaporation area, cooling efficiency as high as 80%. 4.Our cooling pad involve surface active agent, absorb water naturally, rapid penetration, lasting effectiveness. A drop of water can diffuse in 4-5 seconds. Height of absorb water: 60-70 mm/5 minutes, 200mm/1.5 hours, with international standard. 5.Our cooling pad does not contain phenol which is irritant to the skin.It is harmless and poisonless to people and animals. Color: brown and green coated ,brown ,green and Model7090 Height of pad(mm)1500/1600/1800/2000 Width of pad(mm)300/600 Depth of flute(mm)100/150/200/300 Height of flute(mm)7 Angle of flute(¡ã)45 Angle of flute(¡ã)45. The sizes devided into :with frame &without frame. Short on time? Let cooling-pad sellers contact you. Vertical combination í¦cooling pad and faní¦, ventilation and cooling system are the most economic and efficient way to lower the temperature in the poultry house. Years of practice shows that even in the hottest weather, a reasonable program and installation of cooling pad and fan can also control temperature around 30degrees. 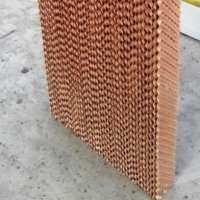 Characteristics of cooling pads: Cooling pad paper has high intensity structure, corrosive resistance, long service life. Cooling pad is made of specially formulated cellulose paper, Cross fluted configuration provides maximum cooling for hot air. Aluminum alloy frame: the frame is made of aluminum alloy of high quality. It is economical and practical and adapts to all kinds of climate as well. The structure is compact so water runs normally but there is no water leak. Installation suggestions of cooling pad and fan: in the process of installation , cooling pad and fan lay out face to face. Cooling pad is installed at the side of windward of monsoon. Cooling pad Cooling pad is simple and convenient to use. Its main advantage is total safety. Traditional treatment for fever such as taking medicine or receiving injections will bring chemicals into your body, thus may harm your body or make you drug-fast. Cooling pad, on the other hand, is a safe cure only for external use. Ití»s totally free of side effects. 2 or 4 piecese in a small box, 100 boxes in a carton. This device is ideal when your laptop tends to overheat. The cooling pad keeps a constant mild temperature. It comes in two sizes, namely 44cm x 39cm and 28cm x 21cm. It can be washed over and over again and never seems to age, like a beautiful woman. Features: 1. Keep constant mild temperature at the bottom of laptop 2. Comfort your legs if the laptop lay on the legs 3. Extend computer average time 4. Softness, resilience, steadiness 5. Exposure resistance, high temperature resistance 6. Washable 7. Environmental protection 8. Fade resistance 9. Aging resistance 10. Non odor. With 2 fans, four legs can be folded. 50pcs/carton, N.W/C: 5kg, G.W/C:5.5kg , carton size: 356x268x202mm. Jiangyin Sat Air Treatment Equipment Co., Ltd.
Evaporative cooling pad description: Uses the new material and the spatial crossing linking technology, high absorbability, high water resistant, anti-mildew and long service life. Large evaporation area, cooling efficiency as high as 80%. The product involves surface active agent, absorb water naturally, fast speed of pervasion, lasting effectiveness. A piece of water can diffuse in 4-5 seconds. Height of absorb water: 60-70 mm/5 minutes, 200mm/1.5 hours, can achieve international standard. The product does not contain phenol which is irritant to the skin and the like chemicalis harmless and poison less while installation and using. It is safe, energy saving, environmental protective, economic and durable. Variety material of shape: galvanized sheet, stainless steel, aluminum alloy panel and so on, satisfy the needs of customers. Variety colour:brown, green, brown and green double colours and black edge(could be cleaned)cooling pad. Evaporative cooling pad description: Uses the new material and the spatial crossing linking technology, high absorbability, high water resistant, anti-mildew and long service life. Large evaporation area, cooling efficiency as high as 80%. The product involves surface active agent, absorb water naturally, fast speed of pervasion, lasting effectiveness. A piece of water can diffuse in 4-5 seconds. Height of absorb water: 60-70 mm/5 minutes, 200mm/1.5 hours, can achieve international standard. The product does not contain phenol which is irritant to the skin and the like chemical is harmless and poison less while installation and using. It is safe, energy saving, environmental protective, economic and durable. Variety material of shape: galvanized sheet, stainless steel, aluminum alloy panel and so on, satisfy the needs of customers. Variety colour:brown, green, brown and green double colours and black edge(could be cleaned)cooling pad. Evaporative Cooling Pad Black Coat£¨washable£© Mixed Yellow+Green Green With Stainless Steel Frame With Galvanized Steel Frame With Aluminum Alloy Frame Model:7090 Color:yellow/green/black/yellow&green Type:Multi-Span Agricultural Greenhouses Application:industry,agriculture,poultry,livestock,greenhouse,gardening and so on Place of Origin:Shandong province,China Height:1000/1500/1800/2000mm Depth:300/600mm Thickness:100/150/200/300mm Port:Qingdao MOQ:1 40HQ Delivery time:10days Payment:T/T Supply ability:1000 cubes per day Packing:export carton Delivery Lead Time:7days Product Features: 1. Adopt advanced equipments and technology, made of special high polymer materials. 2. Corrugated paper, subjected to special treatment, features high strength structure, corrosion resistant, prolonged service life. 3. Fine penetrability and water absorptive to ensure water wet the complete cooling pad wall. 4. Water film can be generated on the surface of the corrugated fiber paper, by which the cooling pad can be cleaned by itself by water. 5. Particular spatial structure provides the largest evaporation surface area for heat exchange of water and air. 6. Fine filtration can protect efficiently against the particulates in the air. 7 There are no substances harmful to the environment. All the material is poisonless, tasteless, energy saving, environment protection, easy installation and removal. 8. Various colors for your selection: brown, black, yellow, green, etc 9. The frame is made of galvanized plate, aluminum alloy or plastic-steel, and the dimensions can be customized according to customer¡¯s requirements. 10. Can be combined with fans to form stereoscopic ventilating and cooling system, which is the most inexpensive and effective cooling equipment in sweltering fields.